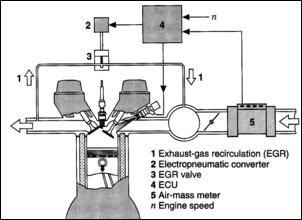 E-G-R stands for Exhaust Gas Recirculation. It’s been around for decades but it’s now becomingly increasingly important in both diesel and spark ignition engines. Computer-controlled, often externally-cooled, and potentially of much greater use than for just decreasing emissions, EGR is making a major resurgence. 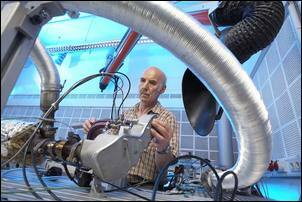 So what are the emissions and fuel economy implications of EGR? Some, including reducing full-load exhaust gas temps in turbo engines without the need to run rich air/fuel ratios, are not at all what you’d expect! So let’s take a new look at EGR. Exhaust Gas Recirculation (EGR) is a process whereby some of the engine exhaust is fed back into the intake. External EGR is achieved by means of a pipe that connects the exhaust to the inlet manifold, with a control valve interposed in this line to regulate EGR flow. For exhaust gas to flow in this pipe, the pressure in the exhaust must be higher than the pressure in the intake. In conventionally throttled spark ignition engines, this pressure differential is present in varying degrees at all loads, and is highest in part-throttle conditions. However, in throttle-less engines like diesels and some direct injection spark ignition engines, this pressure differential is highly dependent on exhaust backpressure. In turbocharged engines, exhaust pressure in front of the turbine is always higher than intake manifold pressure. Internal EGR occurs when the valve timing is arranged so that there is some back-flow into the combustion chamber from the exhaust, or all exhaust gases are not pushed out of the combustion chamber on the exhaust stroke. Such engines normally have variable valve timing so that internal EGR occurs only when dictated by the ECU; when internal EGR is required, this is achieved by increasing valve overlap. Internal EGR appears to be a better approach (at least on engines with variable valve timing) as it avoids the need for external pipes and valves, reducing cost and improving packaging. However, external EGR has a significant advantage – the recycled exhaust gas can be cooled before being fed back into the intake. This is termed cooled EGR. In cooled EGR systems, the amount of EGR flow that actually occurs depends not only on the pressure differential between the exhaust and intake, but also on the pressure drop through the EGR cooler. The actual amount of EGR occurring can be indirectly measured by the intake airflow meter – more on this in a moment. EGR was first widely adopted in the 1970s as a means of reducing oxides of nitrogen (NOx) emissions. In the depicted Nissan system, the amount of EGR depended on two factors – engine load (registered as intake manifold vacuum) and coolant temperature (monitored by a thermal vacuum valve). The higher the manifold vacuum (ie the lower the load), the greater the EGR. 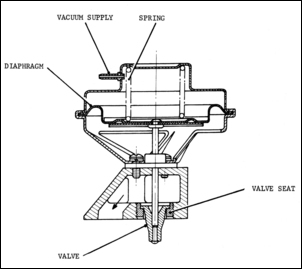 EGR was fully activated only at coolant temperatures above 63 degrees C, was partially activated at 40 – 63 degrees C, and was inactive at temperatures below 40 degrees C.
This Leyland EGR flow control valve consisted of a diaphragm and a valve. The diaphragm was subjected to manifold vacuum and so valve lift decreased with load. However, many EGR valves used more complex operation that this - for example, monitoring exhaust backpressure as well as intake manifold pressure, so preventing EGR on the over-run and at idle. Even in this period, some cars additionally used solenoid control of the vacuum signal to the EGR valve, the solenoid being controlled by a dedicated electrical unit. 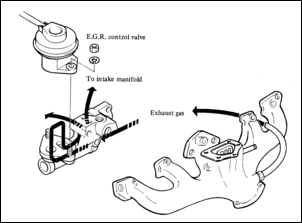 Given that the optimal EGR valve opening varies with load, coolant temperature, pressure differential between exhaust and intake manifold (and other factors), electronically-controlled operation of the EGR valve has obvious advantages. 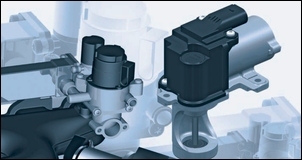 All external EGR systems fitted to current diesel and spark ignition cars use electronically-controlled flow valves. 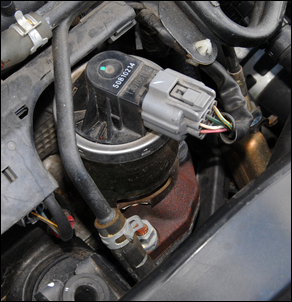 This Bosch spark ignition EGR system uses a vacuum-controlled EGR valve that is electronically controlled by the ECU. 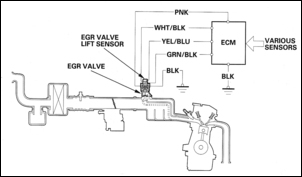 This Honda system uses an electronically-controlled EGR valve that incorporates a feedback sensor to determine the actual valve opening that is occurring. Here is the electronically-controlled Honda valve that is used on the Honda Insight. 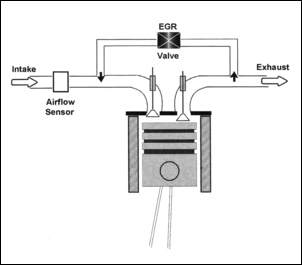 This is a generic diagram of a typical diesel car EGR system. The important point to note is the presence of the airflow meter. By comparing the modelled airflow requirements of the engine (based on rpm, intake manifold pressure, intake air temp and volumetric efficiency) with the actual amount of air being breathed, the amount of EGR that is occurring can be calculated and adjusted as required. In turbo engines, where the EGR source is in front of the turbine, exhaust energy previously available to drive the turbo is reduced. If the amount of EGR is sufficiently large, the turbo will need to be sized to take this into account. EGR reduces the emission of oxides of nitrogen (NOx). NOx emissions are problematic because their generation is associated with lean combustion. 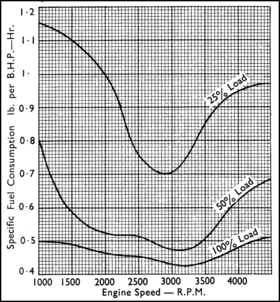 Diesels (that most frequently run air/fuel ratios of 50:1 – 100:1, with a richest air/fuel ratio of about 20:1) and spark ignition engines run in stratified combustion and lean cruise modes (eg air/fuel ratios of 20:1 – 25:1) produce large amounts of NOx. EGR is therefore most often used on engines running lean air/fuel ratios. EGR reduces NOx emissions in three ways. The combustion is cooled by the presence of exhaust gas - the recirculated exhaust gas absorbs heat. The dilution of the oxygen present in the combustion chamber reduces the production of NOx. If exhaust gas is being recirculated, less air will be breathed by the engine, so reducing the amount of exhaust gas produced. In engines that use throttles, high pumping losses occur in part-throttle conditions. That is, the engine needs to do work in order to draw air past the partly closed throttle. One result of this is that as load decreases and the throttle is closed to a greater extent, Specific Fuel Consumption (ie the fuel consumed per power produced) becomes increasingly worse. This graph shows the phenomenon. At 100 percent load (ie wide open throttle) this engine has a minimum Specific Fuel Consumption (SPC) of 0.43 – see the bottom curve. With the throttle open only 25 per cent, the minimum SPC has risen by 63 per cent, while at 2000 rpm, it has risen by a massive 117 per cent! EGR can help reduce pumping losses. This is because the cylinders can still be filled, but without all the gas having to be drawn past the throttle. Up until a certain point, increasing EGR results in lower fuel consumption. However, once that point has been passed, further increases in EGR result in poor combustion behaviour, so increasing emissions of hydrocarbons (HC) and Specific Fuel Consumption. About 40 per cent EGR appears to be the current practical maximum in spark ignition engines. In addition to reducing pumping losses, EGR can be used to reduce the fuel enrichment otherwise needed at high loads. This is especially relevant in current downsized turbocharged engines that spend more time at high loads than conventionally-sized engines. In highly stressed turbo engines, fuel enrichment is traditionally used to cool the combustion process and avoid detonation. Recirculation of cooled exhaust gas can be used to perform the same function, with a consequent improvement in high load fuel economy. The reduced fuel consumption also serves to decrease HC and CO2 emissions. UK researchers working for the engine component manufacturer Mahle conducted testing on a 2-litre, 4-valves-per-cylinder, direct injected, turbocharged and intercooled petrol engine. The EGR system was of the external type and used a cooler that reduced exhaust gas temp to just 20 degrees C. The system added the cooled exhaust gas well ahead of the turbo compressor (note: so apparently not after the throttle body). When running at high power outputs, the engine used a modest amount of fuel enrichment and a large amount of cooled EGR to achieve Specific Fuel Consumption up to 16 per cent better than with fuel enrichment alone. Under the same operating conditions, the reduction in NOx was about 30 per cent, the reduction in CO was 70 per cent, and HC was 80 per cent. The authors also state that “an additional benefit of the cooled EGR technique may be that higher geometric compression ratios can be tolerated in boosted downsized engines...”. Incidentally, in other Mahle literature, it is suggested that on a 140kW engine using 15 per cent EGR and with an exhaust temperature of 980 degrees C, an EGR cooler rated at 24kW is required. Another point is that other literature suggests that either hot or cold EGR reduces exhaust gas temperatures, important in highly stressed turbocharged engines. Finally, implicit in any discussion of using EGR for improving fuel economy is that leaner air/fuel ratios can be used (often in conjunction with a NOx adsorbing cat converter) without exceeding legislated NOx limits. EGR has a long-proven history in reducing NOx emissions. Lean air/fuel ratios are associated with heightened NOx outputs and so reducing this specific emission is a current priority in engine development. Reductions in combustion temperature and pumping losses can be achieved using EGR (and especially cooled EGR), reducing the need for fuel enrichment at high loads in turbocharged engines and improving part-load fuel economy. As a relatively simple and low cost technology, expect both internal and cooled external EGR systems to be very widely used on both diesel and petrol engines.